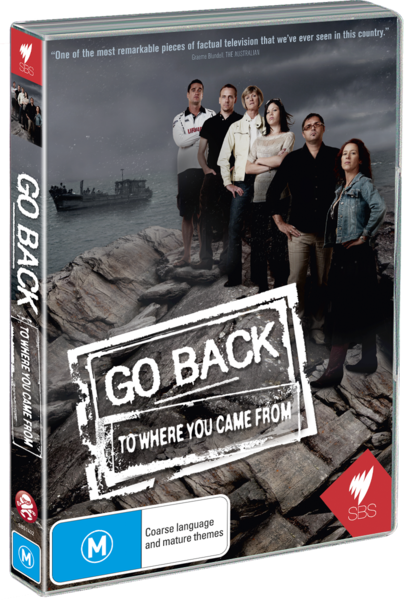 Go Back To Where You Came From DVD Review It’s impossible to review this show without describing the issue it explores. Go Back To Where You Came From occupies an interesting position in the television landscape. It’s reality TV, but it’s not entertaining. It’s informative, but it’s not didactic. It’s emotive, but it’s not sensationalist. When it screened, it was invariably described as ‘event television’. For once, the label was accurately used, and the event in question was actually worthy of being described as such. It’s impossible to review this show without describing the issue it explores. Put briefly, the story is this: Australia is the sixth largest country in the world. With almost 23 million people, we rank 50th in terms of national population. In terms of population density, we rank 235th. Hosting over 20,000 refugees (one tenth of one percent of our population), we take 0.5% of the world’s asylum seekers, being outranked by 45 other countries. But there’s trouble afoot. You see, last year, around 6,000 more refugees arrived on our shores by boat. And that’s the kicker. That’s all you need to cause a national panic in Australia. 6,000 brown people fleeing war, famine, persecution and torture scares the hell out of us, it seems. Our political discourse is now replete with phrases like “stop the boats”, “pull factors”, “deterrence”, and, thanks to a former Prime Minister, “We will decide who comes to this country and the circumstances in which they come.” On this issue, we are ruled by racism, xenophobia and fear - fear of 6,000 human beings who are asking for our help. In that setting, GBTWYCF (hardly an acronym for the ages) takes six Australians on an immersive but necessarily shallow tour of the refugee experience. The show’s over-emphasised wild-card is that the participants will experience the refugee journey in reverse: they start by mingling with refugee families living in Australia, and end up back in the horrific environments from which they fled. I say it’s over-emphasised because, honestly, any engagement that ordinary Australians have with the reality of refugee life is a good thing. Forwards or backwards, it’s a story that needs to be told. The participants range from an uneducated and self-proclaimed racist (“I just don’t like Africans”) to a woman who is surely used to being labelled a bleeding heart hippie. The starting position of most of the participants is depressingly familiar: boat people are freeloading opportunists, flouting immigration law for a chance at the free plasma television that the Australian government has promised them. That’s where they start. It’s not where they all end. The experiences they go on are filmed in a relatively detached and non-interventionist manner (with the exception of one awkwardly staged event involving a leaky boat). The presentation is not heavy-handed. You never feel that they are being exposed, in an unrepresentative manner, to the outlier, worst-of-the-worst cases. While there are tensions and sparks, none of it feels contrived, and little of it is gratuitous. The seldom-seen host, an academic and expert on refugee issues, plays the role of an incredibly calm moderator. All of this means that the show is perfectly constructed to allow the audience to truly see through the eyes of a bunch of Australians who, largely, aren’t that dissimilar from most of us, and aren’t being treated unfairly by a tawdry reality TV production team. It would be easy to simply recite all the places visited, all the tasks undertaken, all the people met and all the suffering witnessed. But to do so would be to miss the point. The triumph of this show is that the experiences are transmitted in as transparent and objective a manner as one could reasonably hope for. Rather than read about each episode in detail, it’s far better that, whether you are interested in the issue or not, you just go ahead and watch it. The show climaxes with a live panel that offers a small window into the kind of cultural impact that this show had (which, while significant, wasn’t as big as it should’ve been). There’s a reasonably worthwhile bit of discussion and almost-debate. And it’s at this point that the show’s real contribution is made plainest. Sure, it hasn’t resolved any of the issues. It may not even have changed as many minds as a pinko commie leftist DVD reviewer might have hoped. But no one can plead ignorance any longer. No one can reasonably pretend not to know the human face of this issue. And, since this show, anyone who does so pretend can be easily revealed as deliberately disengaged. Maybe you haven’t watched this show. And maybe, influenced by the prevailing media narrative and some understandable (but-badly-applied) notions of fairness, you find yourself inclined to rail against boat people. But without having learnt at least a little about the human face of that issue, you’re not really qualified to speak on it. And look how easy it is to learn about it – they’ve even made a TV show for you, and it’s a bloody good one.